Super easy, nice and tangy, and with just the slightest touch of heat, this has been our go-to homemade barbecue sauce for years. Got 20 minutes? Make some! We like lots of homemade sauces, dips, and dressings around here. They tend to taste so much better than store-bought, and we know exactly what goes into them. Plus, they’re super budget-friendly. So it’s pretty much a win all around. 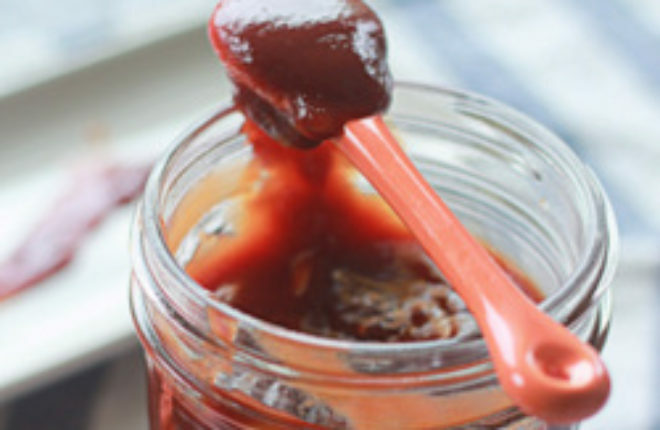 This homemade barbecue sauce recipe is no exception. It does start with store-bought ketchup (I have yet to tackle the homemade version of that), but I figure that when I choose a ketchup with natural ingredients and no high-fructose corn syrup, I’m starting off on the right foot. Tangy, just a little tingly, a tiny bit spicy, and so, so easy to make, our go-to homemade barbecue sauce comes together in less than 20 minutes – and most of that is just simmering time. It’s the base of a Crock Pot barbecue chicken recipe that my resident carnivore loves, as well as the sauce that makes these barbecue pulled spaghetti squash sandwiches. And I cannot wait to try making baked barbecue tofu with it. 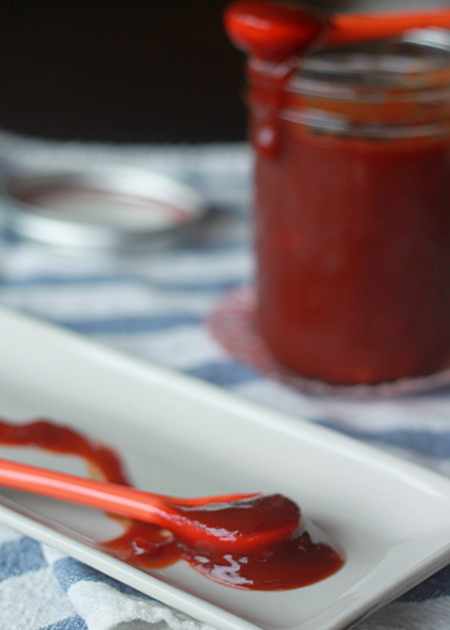 We’ve been making this sauce for years now, and now that barbecue season is heating up (get it? heating up?! sorry), we can’t wait to break it out to brush on and mix into all sorts of good things. Psst: this stuff is also going to make an appearance in an oh-so scrumptious pizza recipe I’m sharing very, very, very soon. Like, tomorrow soon. So y’all come back now, ya hear? (I feel like that phrase is appropriate in a post about barbecue sauce). Add all ingredients to a medium-sized saucepan. Bring to a simmer over medium-low heat, and continue simmering for 15 minutes. Remove from heat and allow to cool. Place in an airtight container. Keeps refrigerated for up to one week. I love BBQ sauce. I’ll put that on anything. I’ve never made homemade ketchup either, but there is a book called 101 things to make at home and ketchup is one recipe. Looks good! I love bbq sauce so much! This makes me crave summertime barbecues, flip flops, and sunglasses. Great recipe! Ahh, summer … I can’t frickin’ wait! Brian Smith on I was in Raleigh visiting old fienrds. We had a decent dinner there during Raleigh’s Dining out week. The food is good, … on The Well at Five Points is re-opening on August 30th.deb in raleigh on North Raleigh really needed Sola Cafe! It’s clean and homey and get the TANGERINE AND GINGER ICED TEA. I always thought that I didn’t like barbecue sauce, but then a few years ago I tried it again and I was hooked. And it’s SO much better when you make it yourself! I am glad you reintroduced yourself! Isn’t it funny how you can think you hate a food but then you try it again and are like, oh crap, I’ve been missing out on this?! Except for walnuts in baked goods. That should never, ever be. This looks exactly like what I need to make for my son’s graduation party barbecue shredded chicken sliders. Yum! The original recipe called for bottled sauce, but homemade is always so much better . . . and cheaper! I like your blog, by the way! Thanks so much, Amy! Shredded chicken sliders are sure to be a huge hit. 🙂 Congrats on your son’s graduation! i luv bbq sauce, it changes the whole dish to a different level. Whenever i make a sauce its always ketchup or soya base with lots of chilies. I would someday try out your bbq sauce and hope i will like it. Thank you for your recipe. Just tried it today for dinner with pulled pork and found it to be great! Used only 4 tablespoons of ketchup and completely skipped the brown sugar as my family doesn’t like things too sweet. Will definitely make again. Thanks for the recipe! I’m really enjoying the theme/design of your weblog. Do you ever run into any web browser compatibility issues? A couple of my blog visitors have complained about my blog not operating correctly in Explorer but looks great in Chrome. Do you have any solutions to help fix this problem? It’s designed to keep the kerf open and prevents wood getting caught on the back of the blade. You now have a table saw dust collector that costs you less money. But you do not have to worry about getting a dusty work shop with a Hitachi cabinet table saw because it comes with a 4″ dust port which you can connect to a shop vac or dust collection system. YUM! I just put this in the crockpot with some chicken. I used your base recipe, then added 3 tbsp (ish) of honey, 1/2 tsp mustard, some onion powder, some oregano and some cinnamon to make a honey husband. Thanks for the recipe! Hahaha – that is hysterical! 🙂 I hate how you can’t edit comments after you submit them. I have made a ton of crazy typos that way! 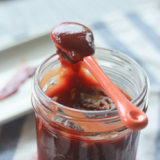 I’m thinking about making bbq sauce as christmas gifts for my clients, is there a recipe that can be made a cpl months ahead of time? Sounds like a perfect weneked to me. :)We braved the horrible weather to go have dinner with a couple of friends and their little girl, and it was wonderful. Then we did lots of playing inside the house, because it’s still snowing around here……….. Happy Monday! Light or dark Soy sauce-without knowing that it will change the flavour enormously! This is a really great, easy and flavorful recipe. Thank you. I also cannot wait to make the spaghetti squash sandwiches. I spiced it up a bit by adding some crushed chipotle peppers. I also started with my own ketchup. It is time consuming, but so worth it. I don’t use fresh from the garden tomatoes. I start with a can of organic tomatoes. It’s less intimidating. Sure, that sounds fabulous! You’ll definitely lose some of the heat (not that the chili flakes add a ton to begin with) but I bet it would be delicious. What kind of Soy sauce are you using for the recipe please? I have light soy sauce (often used for the table) and a much stronger,slightly thicker Dark Soy sauce.Which one I use will definitely affect the flavour significantly! That is a really great question, Krista! I am no soy sauce aficionado … I just use plain old Kikkoman’s. It’s labeled “naturally brewed all-purpose soy sauce” on the front of the bottle. My guess is it’s a lighter soy sauce. I actually misread the recipe (I noticed that after simmering the sauce) I thought it was 2 spoons of ketchup.. But it still tasted great! I will surely make it again! Next time I will use the right proportions 🙂 Thank you for sharing this recipe! Ha, I am glad you still liked it! 🙂 Sometimes little mistakes result in the best recipes! my name is Chuck, i like to smoke meats on my smoker. i think the drippings will make a good tasting base. of cource i will experiment for a good recipe by adding extra ingredients. This is very simple and hits all the right notes. The fresh garlic is worth it! We live overseas and sometimes pay an arm and a leg for not-so-great imported sauce, but I see that coming to an end now. Thanks! I added a little extra of everything but ketsup. Also added some Keepow syrup it don’t taste so ketsupy. This sounds pretty easy to make. I’ve been using Sweet Baby Ray’s (like many people) for quite some time, but it’s about time I put together my own homemade sauce and this looks like a potential winner. I think I want to create a variation though, something with a bit more punch in regards to the heat. Any suggestions for spicey things up a bit? I made this with my dad (we are big on sauces and dips) and it tasted amazing, although we aren’t vegetarian or vegan so we had it on buffalo chicken wings. But to all those people on this website who are like me and want a more meaty flavour – I would recommend adding bay leafs, smoked paprika, smoked Tabasco and (this is the main one, you can leave the rest out) Bisto chicken gravy powder. I really recommend this so try it out when you have the chance. For all the veggies reading this, I gave a veggie version to my best friend and she said it tasted amazing, give it a shot! ?? Ps my friend is vegetarian. I just made this sauce 10 minutes ago. I didn’t have Worcestershire sauce or red pepper flakes, but it turned out fine. Better than making a Kroger run for just BBQ sauce. I have made this recipe several times over the years. Thanks! What quantities/measures will I need for a lesser amount? Say enough for a couple of b-b-ques? And could you replace white wine vinegar for cider vinegar? I would just half the recipe. You can also freeze what you don’t use if you’d like to go for the full amount. Cider vinegar is a bit more tangy and complex-tasting but white wine vinegar would work in a pinch! 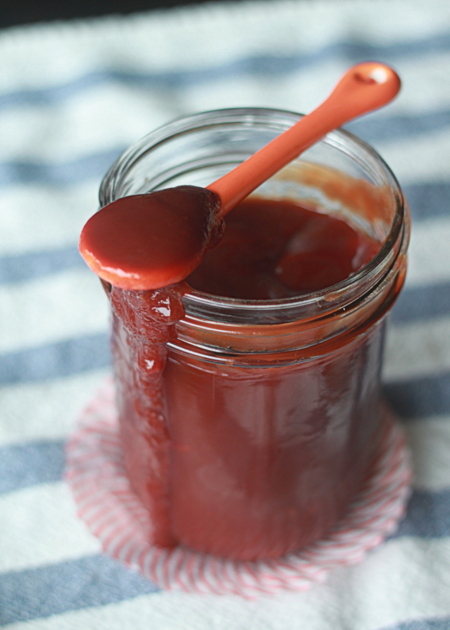 I have tried several other homemade bbq sauce recipes. As a fan of quality control I always end up adding little bits of things over and over again only to end up with a sauce we ultimately don’t really like. Sad. However, I am in the middle of the 15 min simmer of yours as I type. In true type A form, I just HAD to lick the spatula to get an idea of what I’m working with…. and am DELIGHTED to tell you that as of this very moment, my life-long (several year) search for a delicious sweet/tangy/spicy homemade bbq sauce is officially over! Thank you for saving my home-chef life Kare! I’m also a vegetarian (part-time vegan) in a house of almost vegetarian kiddos and a Wisconsin raised carnivore, so I’ll be following your amazing blog from here on out! Hi Laura! I’m so glad you like this recipe! It might be my husband’s all-time favorite (and I love it too). Glad to meet another vegetarian/part-time vegan. Your family dynamic, diet-wise, certainly does sound an awful lot like ours!